While many of us (me anyway) were focused on the FOCA debate during last month's Bishops' meeting in Baltimore, the significance of a vote to approve a revision to the Grail Psalter may have been lost to some (me again). No doubt this is partly because I don't follow liturgy/translation issues, and therefore had no idea what the Grail Psalter was. But the revision of the Grail Psalter is significant to Key readers for at least two reasons. If given the recognitio from Rome, it will change the words by which Catholics pray the psalms at Mass and other settings. And, the new translation is homegrown - Produced by Missouri's very own Abbot Gregory Polan of Conception Abbey with the assistance of other monks at the abbey. Conception Abbey is also the home of our diocesan seminary. 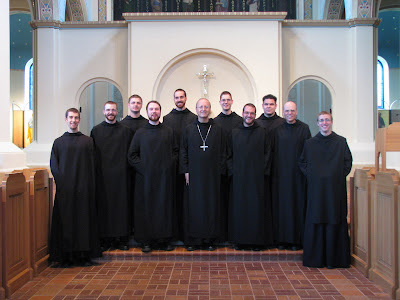 Abbot Polan is pictured above with some of the younger men in formation at the Benedictine community. The life of a Benedictine monk hinges upon the motto ora et labora, which is Latin for “pray and work”. Specifically, St. Benedict intended his followers to be deeply rooted in the psalms, drawing upon their richness in writing his holy Rule and expounding at length upon how they should be prayed. For nearly 1,500 years now, Benedictines have carried on the tradition of their founder, and the Order is well known for its dedication to the liturgy. It should come as no surprise, then, that when the U.S. Bishop’s Committee on the Liturgy wanted a new translation of the psalms for use in the liturgy, they approached Conception Abbey’s own Abbot Gregory Polan to undertake a revision of the 1963 Grail Psalter. What are the Grail Psalms? In the years leading up to Vatican II, when the liturgy was still in Latin but moving toward greater lay participation, the psalm responses of the Mass were permitted to be sung in the vernacular. A French Jesuit by the name of Joseph Gelineau prepared a French translation of the psalms which was very rhythmic and worked well with a particular set of psalm tones. In response to his work, a community of lay women formed a secular institute called The Grail (of England) and undertook an English translation of Fr. Gelineau’s work. They employed scholars and musicians to work on the project and they began to release the fruits of their work in a series of books, each containing a few psalms, throughout the 1950s. The full version with all 150 psalms was released in 1963. Just like the French Gelineau psalm tones, the 1963 Grail Psalter proved to be very well-suited for choral recitation, singing and chanting. It was soon incorporated into the Liturgy of the Hours. While the lectionary in the United States used the psalms of the New American Bible and the Revised Standard Version, the 1963 Grail Psalms were also permitted for use as the Responsorial Psalm at Mass. GIA Publications of Chicago featured these Responsorial Psalms in their Worship III Hymnal. Why was a new translation needed? The 1963 Grail Psalms made a wonderful transition from Latin into English because they were so easily understood, they had a clear poetic rhythm and they could be recited and sung with ease. All of these things were important objectives when the Ladies of the Grail set about their work. And while the 1963 Grail Psalter was very successful in this regard, there are places where the adherence to a set rhythm necessitated a paraphrase of the original Hebrew as opposed to a more authentic translation, taking into consideration the sometimes irregular rhythm of the Hebrew Psalms. Since Vatican II, however, we have seen a move to preserve sacred texts' fidelity to their original sources. Additionally, the Congregation for Divine Worship and the Discipline of the Sacraments’ 2001 document Liturgiam Authenticam insists that a consistent translation be used in all the texts of the liturgy, which is currently not the case as far as the psalms are concerned. The Revised Grail Psalter will be the official translation used in the Lectionary, the Liturgy of the Hours, the texts for all books of the Sacraments, etc. Obviously, a project of this scope is quite the undertaking. But why were monks of Conception chosen to bring this work to fruition? As mentioned above, the mere fact that Conception Abbey is a Benedictine monastery is already a tally mark under the “pros” column. However, it is the combination of the scholarly pursuits of Abbot Gregory Polan that made the initial request from the U.S. Bishop's Committee on the Liturgy in June of 1998 the first and obvious choice. Abbot Gregory would tell anyone (and he told the Bishop's Committee) that he is first and foremost an abbot. Next on the list, though, you'll find “Scripture Scholar” and “Musician”. After working on a translation of a section of the book of Isaiah in the Revised New American Bible, the staff at the Bishops’ Conference—knowing also his musical background—rightly assessed that his combination of abilities especially suited him to the task of revising the Grail Psalter which, like the 1963 Grail Psalter, needed to be suitable for choral recitation, singing and chanting. When Abbot Gregory agreed then, mentioning that he was first an abbot though, the bishops were happy to communicate that they just wanted it done right. So, Abbot Gregory began the project, enlisting the help of other monks of Conception Abbey, and after four years an initial draft was completed. This draft was then brought before a November meeting of the Bishop's Committee on Divine Worship where it was approved to undergo the rigorous process to deem it an acceptable translation. And acceptable it was as the USCCB approved its widespread use in a 203-5 vote at their meeting of November 11, 2008. It is now awaiting approval from the Vatican. What does this mean for the Church? For the Faithful who attend any liturgy in English, the Revised Grail Psalter means consistency in what they'll hear across the board. For musicians and those who use the psalms for choral recitation or chanting, it means a translation which is well suited to these uses without sacrificing the integrity of the translation. All in all, the consistency and fidelity to the ancient texts of the psalms means that the Revised Grail Psalter will help promote a more effective, unified catechesis. For Conception Abbey, the Revised Grail Psalter is another way that they, in their 135 years since their founding, have been able to respond to the needs of the Church. The copyright for The Revised Grail Psalms is held jointly by Conception Abbey and The Grail (England). GIA Publications serves as the international literary agent for this new version of The Grail Psalms.